Raynell Andreychuk was born in Saskatoon on August 14, 1944. She completed a BA and a law degree from the University of Saskatchewan in 1967, and established a law practice in Moose Jaw. In 1976, she was appointed to the provincial court and helped establish the family court in Regina. Andreychuk was elected chancellor of the University of Regina in 1977 and served eight years. She left the court to become associate deputy minister for Social Services in Saskatchewan. 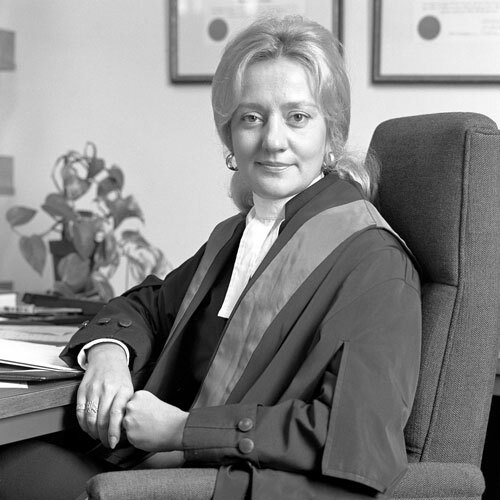 In 1987, Andreychuk was named high commissioner to Kenya and Uganda, and Ambassador to Somalia until 1990 when she was appointed Ambassador to Portugal. During her diplomatic career she served on several United Nations committees, including the Environmental Programme and the Human Rights Commission. In 1993 Andreychuk was appointed to the Senate, the first female senator from Saskatchewan. She has served on a number of senatorial committees. Andreychuk has also served on a number of volunteer boards. Between 1975 and 1981 she served as national president and international vice-president of the YMCA and played an active role with the United Way of Canada and Big Sisters Canada.